A new way of working? At a recent Critique Group meeting we discussed the differences in the way we work. Some artists work many pieces at once and others of us MUST complete one painting at a time before we can move on. That is me. The exception to this is when I am working in more than one medium. 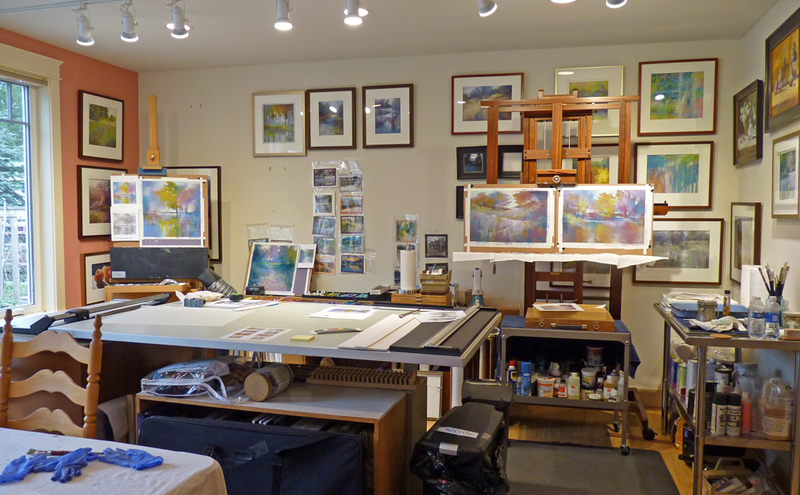 That's one of the reasons I have two work stations set up in my studio: one for pastel and the other for wet media. 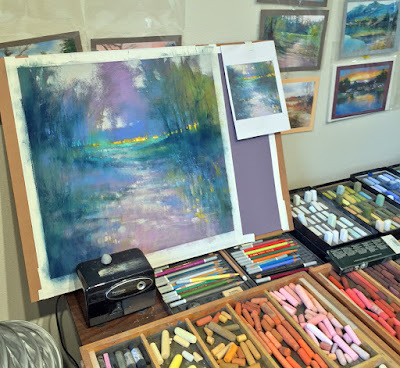 However, for the past few weeks I have a project going that requires working in pastel on eight paintings simultaneously and they are in sets of two. 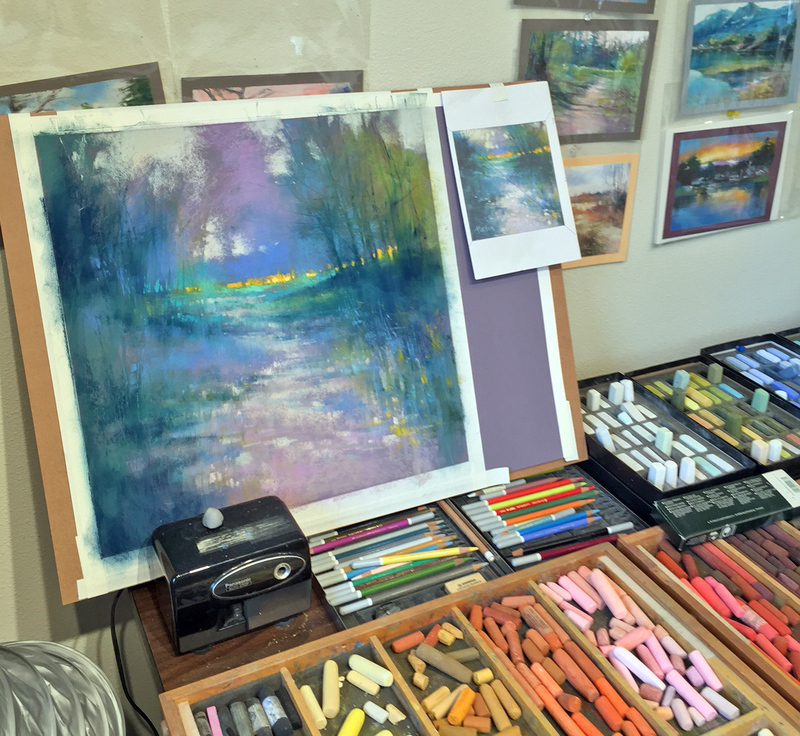 I'm having a little trouble keeping my pastel sticks organized so I can find the colors for each painting set. Other than that, I find this very interesting and perhaps I've stumbled upon a permanent new way of working. Each morning I work on one set for about 2 hours. By then, I'm tired and it is when I get tired that I start making bad decisions. So, I take a lunch/laundry/walk around the garden (which inevitably leads to weeding) break. Later in the afternoon I paint on another set for a couple hours. This seems to be working because the next morning when I enter the studio I am pleased with the results of the day before. Paint it again, Sam. Sorry, couldn't resist. Here's the companion piece to Dappled Path #3. I'm working from a reference photo of the original painting, "Born to the Season" for a new version, 18 x 18 inches. This is a work-in-progress shot of the painting at about 60% done. I'm working on Canson Mi-Teintes TOUCH in my favorite color, Twilight. I'm finding this "paint it again" process very fulfilling. My strokes and color nuances have matured since 2010 when I first painted this scene. 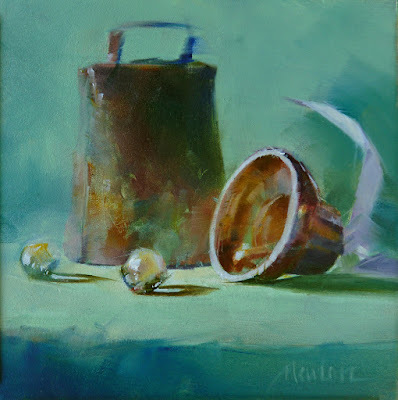 Early this year I painted a 6x4 inch study (#3) for Dappled Path. 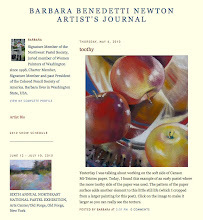 I posted it on DailyPaintworks and my collector, K.B., purchased it. 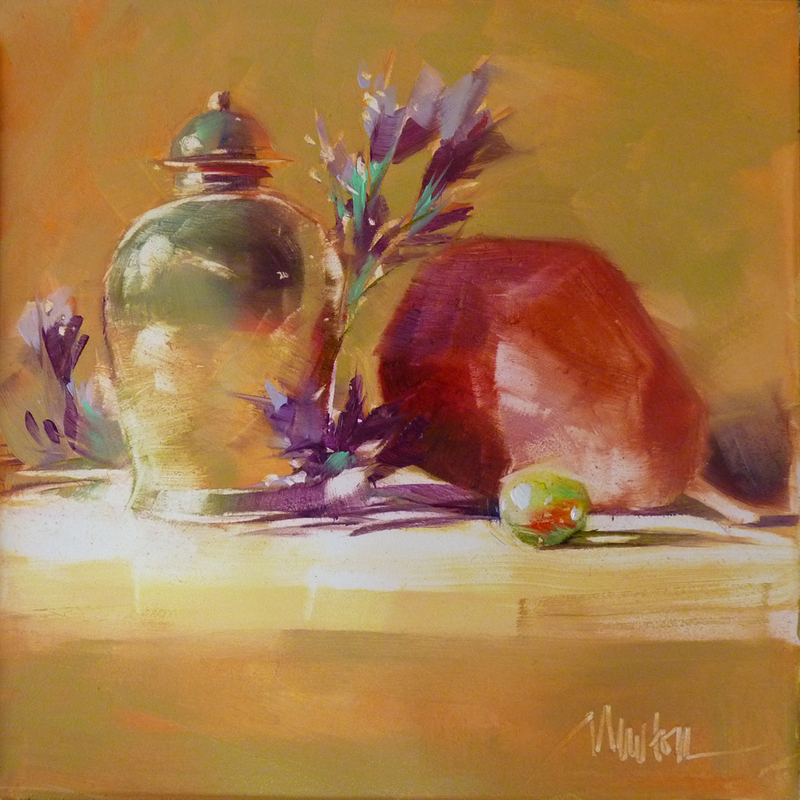 I have been requested to paint it again, larger and this time in a square format. I took the image of Study #3 into Photoshop and changed the format to square and printed it out to use as my reference photo for the new painting. What a fun exercise - not only enlarging the size but also changing from a vertical to square format. I think it is about 95% complete now...the final 5% is the challenge. Play up the nuances but don't get too detailed or cute. Keep the freshness. Suddenly it's Spring on the lake! The transition into this new season is a blur, first it was taxes, then spring cleaning of my art data base that holds data back to 1992 (big job). Then a couple great opportunities came along. I'll be able to talk about them later. One is complete, the other I'll be busy with until June. 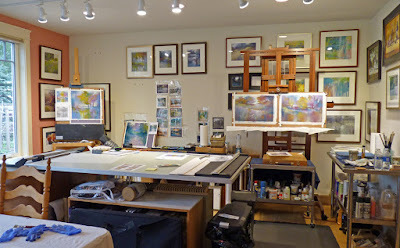 And of course, there is spring cleaning of the studio and review of my art inventory. 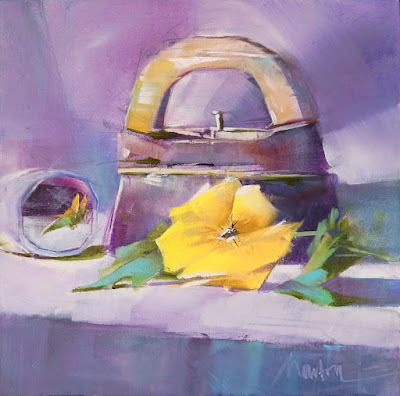 I am offering three of the little oils from my still life oil series - the last ones painted in my old studio - on Daily Paintworks and Etsy.